On Monday night, the girls performed a special flag dance at the teke s (ceremony) for yom Yisrael (Israel day, our special day themed around Israel) and rocked the house! 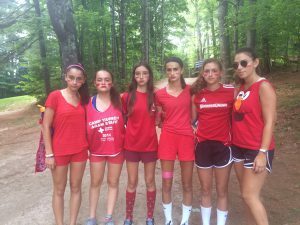 The girls demonstrated what it means to be part of shivtei Yisrael (the tribes of Israel, throwback to Yavneh’s 2012 theme!!). Tuesday was a nice, warm day in the morning, and a nicer, warmer day in the afternoon. Between football practice for the girls getting ready for Powderpuff (their game against Ma’alot, the aydah (age group) above us), the boys playing soccer, and free swim, we milked the day for all it was worth. Tuesday night, we prepared for KTV (our lip syncing competition) with all of our might. On Wednesday, we did more KTV preparation and some other stuff as usual (WHICH WAS SO AWESOME), like frisbee. On Wednesday night, we performed: Our theme was TV theme songs. The girls performed a medley of Friends, Dora the Explorer, Gossip Girl, and more, and the boys performed a remix to the Little Einsteins. While neither of our performances placed, we still felt like winners all the same. Thursday brought thi ngs to the next level with our achla yom (literally awesome day, our day with an alternative schedule). We stayed in camp this week to play Powderpuff in the morning! The fight was close, and our banot (girls) played with all their might. While we lost to Ma’alot banot in overtime, we still had an incredible time. The afternoon was filled with ice cream, games, and trying to stay cool on one of the most intensely hot days of our kayitz (summer). After a delicious BBQ (shout out to the portobella mushrooms for vegetarians) we had a Levi’im talent show! Guitars were played, jokes were told, and one person even made a pretty convincing bird noise. We looked back on our past week and realized that throughout the week, despite the heat, despite the ups and downs of the universe, we were at camp, having the summer of our lives.